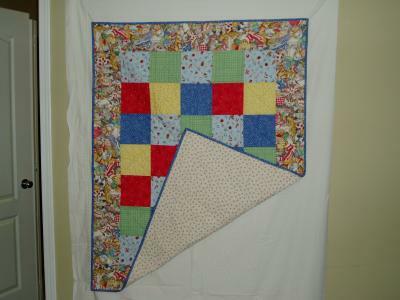 After practically living with Jackee I had always admired her beautiful quilts and had wanted to try making one myself. The opportunity arose when one of my girlfriends became pregnant. I really wanted to give her something special and personal for her shower so a quilt seemed to be the perfect gift. With the help of a couple of friends I successfully completed a slightly larger than normal baby quilt, which little Riley plays on during the day and snuggles up with at night. Congratulations Erin! I'm so impressed that you made your friend a quilt. It looks wonderful! I'm looking forward to seeing more projects from you!